The Anti-Casserole | A podcast for creative women swimming upstream. A podcast for creative women swimming upstream. This week on our epilogue for The Anti-Casserole Podcast, we talk about what we will be working in our creative lives and what’s next for The Anti-Casserole. Also, THANK YOU’s. Lots and Lots of Thank you’s. Comment below and let us know if you would like a Season 2. And what you would like to hear on Season 2. We want to hear from you! Tweet us @AntiCasserole or comment below at www.anticasserole.ca. Shout out to Hip Hop Artist and Producer, Noyz, for our theme music. Support the podcast by Donating here or at our website: www.anticasserole.ca. This week on The Anti-Casserole Podcast, we take in listener requests and do a reflection and review of the completion of our creative project – this podcast. We, compassionately but critically, ask ourselves questions about the process of this podcast from inception to completion. This episode serves as an important tool for us to share with you our journey but also to provide an example of how to do a review once you have reached your end goal. P.S. We reached our end goal!! Wow – Thank you so much for getting us there. But more warm fuzzies will follow next week in the epilogue. TAC 09: When did you decide IT can’t be done? 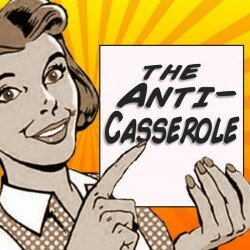 This week on The Anti-Casserole Podcast, we ask when did you decide IT can’t be done? Whatever that ‘it’ was. Did you stop dreaming and envisioning the life you really want and settled for the life you were getting?Get rid of the ultimate downer word: “CAN’T” and replace it with “It’s just a matter of time”. We use goal setting and related strategies to create the life you desire. This week on The Anti-Casserole Podcast, we dissect one of the biggest personal issues that we have faced and seen other women face – Self-Sabotage. Insecurity, unworthiness, panic, fear, guild, shame, flaking, procastinating – what does self-sabotage look like for you? And how does it impact the work that you do. We offer tips and tools on how to build good habits so that self-sabotage doesn’t lurk below the surface and catch you off guard next time. TAC 07: Occupy Your Lunchbreak! This week on The Anti-Casserole Podcast, we continue the conversation about women in the workplace. We honestly discuss the experiences we’ve had in our adult work lives and what we’ve learned along the way. We bring forward strategies that we think women and allies can use to create better work environments. And it starts with Occupying your Lunchbreak! We wanted to apologize for the use of the word crazy. We will work to be more vigilant of our usage of language that reproduces power inequities. It can be an offensive and ableist term. It can stigmatize people working through mental health issues. This week on The Anti-Casserole Podcast, we get into the realities of women in the workplace, particularly in the Non-Profit sector. We bring up challenges that we have faced and how these challenges are indications of systemic issues despite how much we ‘lean in’, be more ‘confident’ or work through our lunch breaks. We had to take a short, unintended necessary break last week. Thanks for the patience! We want to hear from you! Tweet us @AntiCasserole or comment below. This week on The Anti-Casserole Podcast we tackle all the changes that will be happening around us and within us when we start standing in our truths – we call this Growth Tension. When this discomfort comes, it is so easy for our lizard brain to win out and the big F-word – FEAR – to take over but we share strategies on how to move through the Growth Tension to the truer you! This week on The Anti-Casserole Podcast we take the conversation from the external to the internal. Sometimes the biggest hurdle in the way is… Ourselves. Let’s talk about the ogre that is the Hater Within and bring it out from the shadows. This big scary ogre, The Hater Within, is really just a cute puppy that needs to be loved. Listen in to our discussion as we hesitantly shine the light on the voice of The Hater Within. TAC 03: Who are your Top 5 and what does that say about you? This week on The Anti-Casserole Podcast we dig into the business adage that says: you are the average of the 5 people you spend the most time with. Think of the people you spend the most hours with each week – this includes family, partners, co-workers and friends. Think in terms of income, outlook, values, resiliency… probably laughter too. Does their companionship encourage optimism? Creative productivity? Courage? Do they support your successes and make you feel great enough to go and build the things you envision? If time is our most valuable currency, and our community is our most important investment, let’s spend wisely! We have more ability to curate this reality than we often think. (But don’t worry – you don’t have to fire your Mom and break up with your friends.) Join us as we get into it. Special thanks to Sacha and the Technicians for the audio editing and post-production. Check them out for the great services they offer. TAC 02: It’s time to take up your space! An episode for the women out there who quietly take on the world – professionally and personally – as well as everyone else’s worlds… and needs… and emails… You know who you are! This week on The Anti-Casserole Podcast we talk about reconsidering the “I have to” narrative, and the times we need to take up more of the space, and less of the load. Stretch out ladies! This is the occupy YOU movement. The Anti-Casserole is a podcast for creative women swimming upstream. Follow the journey of two young women in Toronto as they learn and share what it takes to live the creative life.